See original article on the Daily Press website. Carrie Okey, the Rescue Divas creator, Northwest Wisconsin CEP Focused Initiatives Manager and volunteer EMT with the Washburn Area Ambulance, said while she knows this project as “Boundless Together,” it’s being called “Project 72” because they are highlighting a program in each of Wisconsin’s 72 counties. The inaugural Rescue Divas EMS Summer Camp for Girls was held in June of 2015 at Northland College and again the following year in June of 2016 at Camp Northwoods in Mason. Okey added that during the week they also receive training in First Aid, CPR, and AED use. 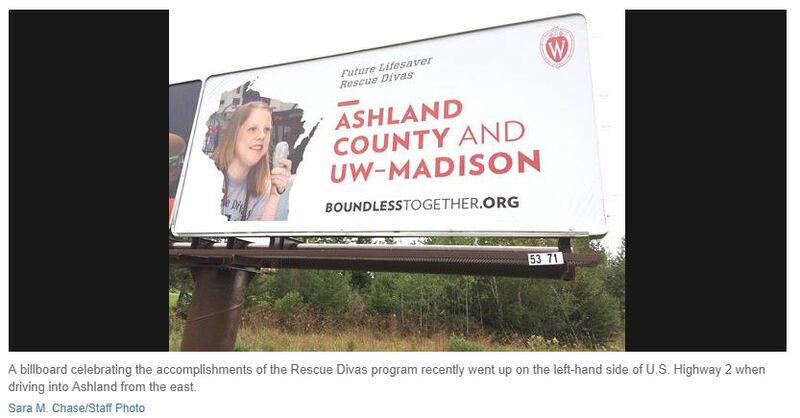 The billboard is located near three other billboards on the left-hand side of U.S. Hwy 2 when driving into Ashland from the east. Okey said it also helps to get the word out that EMTs are needed in all of our rural ambulance services. Okey said Rescue Divas is also a ton of fun. Okey wanted to repeat the fact that there is current a shortage of Emergency Medical Personnel in the area. “Click on Ashland County and you will see more about us,” she said.